Our user-friendly survey tool walks you through 160 questions to form a well-rounded view of your church and its health. The survey tool is mobile-friendly and can be accessed on any internet-connected device. At the completion of your survey, you'll be provided with multiple reports that show you where your church ranks on six major aspects of church health along with an average health score. From here, you can make plans to improve weak spots and further increase your church's strengths. Must include at least one capital letter, one number, one special character and be 8 characters long. You are encouraged to hand-select 15% of the active church population to complete the survey. 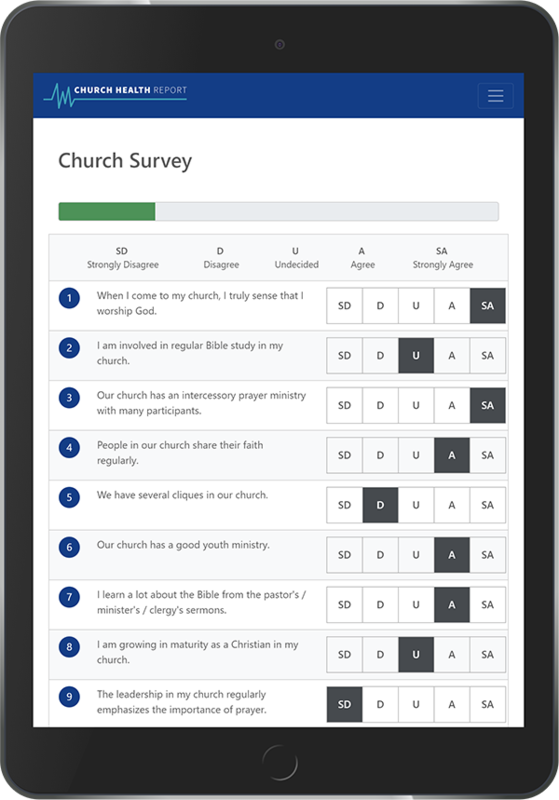 The base package includes 45 survey responses for a church up to 300 attendees. You may purchase additional survey responses now or any time later. All transactions are securely transmitted to a third-party provider for processing. We do not store any of your credit card information on our servers. This transactions will appear on your card statement as "CH HEALTH REPORT SRV"
© 2019 Church Health Report. All Rights Reserved.